Szymon Nehring was declared winner tonight of the 15th Artur Rubinstein Competition in Israel. In addition to the $40,000 first prize, he won five other supplementary awards. In second place was the Romanian, Daniel Petrica Ciobanu. Third was the American finalist, Sara Daneshpour. Aged 21, Nehring is regarded as Poland’s finest young pianist. In the 2015 Chopin competition in Warsaw, he came sixth. Peter Donohoe, one of the judges, says the jury vote was almost unanimous. Small correction: Nehring won the audience award at the Chopin Competiton 2015, however he did not place in the finals. Yes, he did reach the finals, playing the Em concerto, but was not among the 6 prizewinners. He did go to the finals. I was there and he performed. Chiobanu deserved the first prize but the jury was too much conservative and hesitant. Chiobanu is a gifted pianist and he’s the real artist among all the other contestants this year. The kind of artists who precede their time. Interesting to see Nehring at the Fazioli in this photo – he chose the Steinway in Warsaw. I can not agree with you about Ciobanu. Except for few mistakes in Mozart’s concerto, he had a credible and brilliant appearance in all stages. You can see that until now he had won first prizes in all the international competitions in which he participated! So? In Israel he is eccentric and unreliable and in all other countries he’s the opposite? In my opinion he is definitely not eccentric. He has style and personality as many of the great pianists, like Glenn Gould and others, who had a unique musical personality. I salute your unconditional enthusiasm! As someone who sat through Rounds I and II (but not the chamber and concerti performances) in Tel Aviv, I have to say that I do disagree with the the final results, at least based on what I heard in the solo rounds. While I admit that Nehring has great fingers, I sometimes felt that he did not know quite what to do with them. I never felt much excitement from him. He has a quiet demeanor, sort of stoop shouldered, and self-effacing, though I was not sure if that was shyness or an act. I think Ciobanu will have a performing career, but that Nehring will be a teacher. A rather satisfying result, not only is Nehring already accomplished, (even if his Rach3 wasn’t perfect), but also the most promising to develop further, musically. After all the recent discussions and controversies about corruption in competitions it was refreshing to see that neither 1st nor 2nd prizewinners belonged to the habitual “hothouse” schools or prestige teachers. Another amusing aspect: after the notorious 2014 rout of Steinway, ( 5-1 to Fazioli in the finals! ), this time Fazioli proved that it was no fluke, not only having the 1st and 2nd prizewinners, (plus another finalist), but also scooping all the auxiliary prizes, (audience, junior jury, chamber music, Israeli contemporary work, Chopin interpretation..etc). Quite a refreshing experience all round! One of the less rewarding aspects of being a competition jury member is reading anonymous expert opinion about how we got it wrong. Please remember that a jury comprises several people, and therefore multiple points of view – in this case eleven – and we don’t demonstrate being ‘conservative’ or ‘hesitant’ or any other blanket description. None of us know the way the others were thinking because most competitions prevent discussion, and most jury members adhere to the rules. The final result, as I wrote, was almost uninaminous; that fact was shared officially with us by the jury chairman, but we were not privileged to know which jury member, or indeed how many jury members voted another way, nor which way that was. In other words it could have been any of us, myself included. I want to make clarify that I had no intention of insulting anyone. The rules of the competition are known to me and I don’t suspect the integrity of the honorable judges. The head of the jury (Vardi) in all interviews before and during the competition emphasized the fact that the aim of the competition was to look for the real artist among all the great pianists. Finally, an excellent pianist was chosen with sensitivity and good abilities but it ends over there. He was lack of uniqueness, especially in the recitals of the solo piano. On the other hand, the outstanding pianist (in my opinion and following the opinion of professional music critics and journalist and musicians in Israel), the one who demonstrated artistic spirit and performed with so creative style and sometimes even controversial one was Chiobanu. I still cannot forget his revolutionary interpretation to Mussorgsky (it was like composing the work again while performing it) and his Encore was stunning. He also played brilliantly 7th sonata of Prokofiev with so many colors. I have been following the competition in Israel for 25 years (since 1992) and I do not remember hearing a pianist so special with this sort of musical finger print during these years. Ciobanu is an artist who thinks outside the box and his interpretations allow us to see familiar works with a new light. Unfortunately, Mozart’s concerto made some bad impression of an unstable pianist and I think that’s why he was not chosen first. Well, Mozart was a cruel composer. Even the smallest mistake in his concertos might sound like an earthquake… But the second prize is of course a highly respected award and in my point of view Chiobanu is blessed with a gift named star quality (or personal charm with technical perfection and brave musical approach, like so many legendary pianists had when people waited to hear their new records, came from distance to see them playing in recitals and at the end asked for their autographs on their musical albums with an excited gratitude). I have no doubt that Chiobanu is going to make a brilliant career as a remarkable pianist (he will be among the few who did succeed in making a career out of Rubinstein competition). I want to add that I was quite embarrassed to read an interview with Arie Vardi (to Haaretz newspaper today) admitting that he thought Chiobanu was a wild man (savage) and a bit “Chalturist” (expression in Hebrew that means “unprofessional”[! ]), although he admits that Chiobanu has a character. This is a disrespectful statement to a pianist in Chiobanu’s level. A chairman of a jury should not have used such descriptions (even though Vardi admits that the situation has been changed at the end with Prokofiev’s concerto. Well, later is better than never…). Finally I want to congratulate all contestants in Rubinstein piano competition – in the spirit of Ciobanu’s words before his Encore – keep on making music! I think you are correct in predicting a concert career for Ciobanu, he was clearly a great favorite with the audience and has that “unique” quality you mention. I would still maintain that in competition terms, it would be hard to justify a 1st prize for a player who has a less complete grasp of all aspects of classical style. In fact i was relieved to see him in the finals at all, and delighted that he got a very honorable 2nd; with a less imaginative, academic-bound jury it might have ended much earlier for him! A 1st prize in any competition these days is no guarantee of a lasting career and historically, several musicians have shrugged off lower-prize disappointments, (Andras Schiff, joint 3rd(!) Leeds 1975), Louis Lortie, 4th-Leeds 1984), or even our esteemed correspondent, P. Donohoe, 6th(! )- Leeds 1981, which was re-balanced by his Moscow Tchaikovsky win the following year. Ciobanu will have little need for official, “establishment” recognition if he continues this way and develops even more. I was glad to read both of you – Mark and Paul Davis. Since my English language is not my mother tongue but my Hebrew, I will not add too much to what you have written because you both have well articulated the uniqueness of Chiobanu. After following all the stages of the competition (with all contestants) I could not help admiring his extraordinary abilities and perhaps that is why I was so excited. It does not mean that Nehring is not good, but there are dozens of very good young pianists like him and maybe that was my problem with him. He plays very well indeed, but has nothing new or unique to say with the piano. His anemic musical personality did not help either. However I can not agree, Mr. Davis, about what you wrote about the fact that Chiobanu was lucky to be second (thanks to an imaginative jury) – because he won first prize in all the international competitions he has attended so far (and the judges are mostly the same judges and the pianists are almost the same ones). He has all the skills to win an international competition; the problem was solely with Mozart’s concerto. 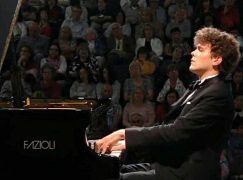 I know there are many great pianists who didn’t take the 1st prize but this is the goal – to win, and competitions are maybe not the only way to be exposed to an audience but yet it’s the common way to do so – most of young pianists today compete all the time until the big breakthrough is coming. Well, we are disputing a minor nuance! I would say that to take 1st prize in three hardly-known competitions, (Brazil, SouthAfrica, Morocco! ), – bravo, certainly (and nice choice of voyages)- then to take 2nd in a major, prestigious competition is not so bad. I also followed all the stages, and while i greatly enjoyed Ciobanu’s verve, skill and imagination, there were several points where i said to myself: “what a pity, that will count him out,” not just the Mozart concerto but…… how well do you know Schumann’s Piano Quartet? So, lucky, partly, and also an imaginative jury – i’ve seen players eliminated for lesser slip-ups. Not only Ciobanu’s unique qualities kept him in the race, but his choice of “starters” in 1st & 2nd stages was winning material; gorgeous Enescu, and a firecracker of Silvestri, honoring his country’s composers while fascinating the audience. And at least, for followers of this blog, Ciobanu’s name is now the most mentioned! By the way, your expression in english is excellent and eloquent. More “stupendous competition winners” to be added to the list of hundreds playing the same old hackneyed works. What a helpful contribution. I take it you have a follow up post, detailing constructive ideas of what we should be doing, and which works the competitors should be playing? But the literature is finite and exhausted; and getting on for 200 international piano competitions are held per year producing at least 600 “laureates” with no objective criteria for ranking them. But of course, no-one can compete with Khatia Buniatishvili. What a preposterous response; I wouldn’t have normally responded, but I would love to know whether or not you are serious. You snipe at competitions, you snipe at the jury, the competitors, the repertoire and even the music. [‘Wreckedmanenough….? I tested it to see if it was a possible iPad spellcheck thing, but it is not. No doubt you use the nicknames Bang Bang and Deathrattle as well.] You suggest no practical alternative to the situation about which you complain. And you hide behind the name French Hormone. The serious answers to the rest of your master contribution is that the choice of repertoire is made entirely by the competitors from a list of suitable pieces. For the competition to include in that list anything other than standard repertoire works should be foolish and irrelevant, given that a prize-winner is almost certain to be asked to play works from the standard repertoire as a result, and needs to know them. The choice of repertoire obviously doesn’t affect the choice of finalists, so if the finalists who happen to have been chosen have coincidentally selected a small number of works for the audience to hear, that is just too bad. If you are looking for any sign that competitions do anything for new music, I can tell you virtually every competition I have ever been involved with commissioned at least one work. And if the market is flooded by too many prize winners, that is hardly the fault of the competitions or of the competitors. As for your final paragraph – is there a point to what you say? Khatia Buntiashvili wasn’t in the competition. However, it is certainly true that she has many qualities that no one else has. It is also true that her most recent CD release is of Rachmaninov Concertos 2 and 3, and that previous discs have been of equally standard repertoire. This has been fun. Thanks. It seems that you simply don’t like piano competitions as a genre; that’s fair enough. Me neither! I was involved very slightly in this one for personal reasons, so i’m trying to find some balance. Concerto repertoire neccessarily has to be limited to a standard number of works, the orchestra needing a minimum of preparation, so one has a good chance of an unlucky dip, with six Rach3’s, or six Prok3’s, that’s the way it could go; this time we escope with three of each! I’d also love some refreshing choices, Moz 9-19, Tchaik 2 & ConcertFantasy, Rach 1&4, three Medtners, Tcherepnin, Palmgren, Martinu…… but you could have problems with too wide a spread, and scores/parts to be ready if by chance someone…….! Can’t think which Granados concerto you’ve discovered, altho i love the idea. True that certain works are too often stretched on the Rack- man, enough! In terms of solo rep, the choice was obviously a bit wider altho we were prisoners of several Prok6 & 8, Liszt Don Juans and Ravel LaValses, which must be doing the competition circuit currently. Relatively little Chopin was offered and thank heavens, only five Gaspings in the Night, (as you seem an expert on French whore-moans! ), two of which i suffered, vraiment, Gaspillage de la Nuit! As it happened, the 1st & 2nd prizewinners had seized the occasion to honour their musical heritage with Szymanowski and Enescu plus Silvestri, Ciobanu, particularly with these last two, was marvellously refreshing. I share our esteemed correspondant, P Donohoe’s mystification about the inclusion of Khatia Bumiatshivili, (with great restraint i desist from using my habitual nickername for this artits), possibly you think her P. R. Knottenoff…. (have i discovered a new concerto?). Rachmaninov 1 is already on the list of possible concertos at several competitions. Rachmaninov 4 is the most difficult piano concerto in the repertoire for the orchestra and conductor, has one of the largest orchestrations and needs at least two rehearsals – no self-respecting orchestra would agree to it otherwise. Tchaikovsky 2 has monstrously difficult violin and cello solo parts, lasts for 48 minutes and is not known to most orchestras – i.e. again, probably two rehearsals. Tchaikovsky 3 is only 15 minutes long, therefore difficult to program, even less known to orchestras, and the orchestra part is very complex. Granados is an intriguing idea, as he was a very fine composer, but it is an unknown work to me, and I know most things, so, although it might be known to the orchestra in Lleida (Granados’ birthplace), I do not think there is much chance of it being familiar to the Israel Philharmonic. Medtner is marginally more practical, but again orchestras generally do not know it – either inside or outside of Russia. That the competitors chose 3 Rachmaninov 3s and 3 Prokofiev 3s is a coincidence, had no bearing on the choice of finalists, nor on the results. The main point, however, is that, although we hope that the public will support the competition throughout – and indeed in Tel Aviv the public was fantastic – the purpose of the works performed are to demonstrate the artistry of the competitors, not to make entertaining programs for people like yourself. In other words – think a little outside your box before posting impracticalities. The main point, however, is that, although we hope that the public will support the competition throughout – and indeed in Tel Aviv the public was fantastic – the purpose of the works performed is to demonstrate the artistry of the competitors, not to make entertaining programs for people like yourself. Orna Langer writes: “About Prokofiev’s 3rd concerto – Chiobanu played it as a Mephisto – as if Prokofiev had become a bone of his bones. The philosopher Avishai Margalit had an expression called “being in the picture”. In other words, Chiobanu lived and breathed every single note. Not only the enchanting Cadenza and the dialogue he had with the wind instruments-the horn player, the flute and the oboe. He played the concerto as a Demon – every note was a miraculous discovery-yet everything was in a necessary state and nothing was accidental. His whole body was alert and attentive to the orchestra. The wind instruments answered him with love. It was different pianism – smart, creative, original and full of fire and an expression of supreme joy”. It’s really nice to know that even though I’m not a professional, there are professionals who think like me. The first prize of any major competition is a wonderful opportunity if you are up to dealing with what comes with it, but it is also very onerous. The music world at large will make no allowances for anything – you won first and are therefore deemed by the jury to be the most deserving, and so you are under the microscope from that moment onwards, wherever you were before the competition. There must be no weaknesses in any of your repertoire, unless it is repertoire that can be avoided. Any other prize is a blessing in many ways – you are still allowed to develop, to grow, to experiment, to fill in the gaps, and to avoid the microscope; your life is not turned upside down by instant uncompromising success – rather your artistic being is spotted, supported, publicised to an appropriate degree, and watched until the opportunity to win at the right time presents itself. I am not being specific here – this is about competitions in general. It happened to me nearly 40 years ago, and I am very grateful for it. Competitions are far from perfect, but there is no alternative – other than luck, networking, personal wealth or backing from big business – and those involved in running the worlds major competitions are trying to improve all the time. There are two reasons for not accepting competition jury invitations. One is the amount of sitting, which is definitely not good for the health of the jury members, and the other is having to deal with unthinking online opinion, which is probably worse for the health of the jury, and definitely for that of the competitors. Do you actually think we don’t consider the things you write about so easily from outside the jury – well in advance of when you write them? I want to say that it was a pleasure reading you, Mr. Donohoe, I was inspired by your words and I learned from it a lot. During musical debates, we sometimes forget that people are involved here and can hurt other people, especially among the contestants. I might have underestimated what I wrote and I am really sorry if I offended anyone from the contestants, especially the young pianist who won. Competition judges usually do not respond to the general public and prefer to stay in their “ivory tower”. I think you have done a noble and beautiful thing by sharing your views with us, the public, and here on this blog. I really appreciate it. I’d like to add that in Israel an interview was published with Nehring, it was taken probably few moments after his winning. The Israeli journalist writes that he asked to interview Nehring, but Nehring apologized and asked politely for a moment, then he asked you (Donohoe) to sign for him a record (musical album) of you that he had brought with him and kept the whole competition waiting for the right moment. When I read it, it was a very moving moment. I was very moved by this gesture; because this act showed me how much Nehring is a modest person who appreciates fine music and despite being an estimated pianist, he also admires great artists and remember (even in his “triumph moment”!) to appreciate other musicians. My heart really went out to him at that moment. And about you, I think you’re not just a great musician but a good person (“a Mensch” – in Yiddish). So thank you. Thank you for having such courage to make you comments. This got posted in the wrong place. Apologies. It was meant as a reply to French Hormone. I am – like „Name“ – only a member of the public (and only via Internet) and I certainly would have given 1st prize to Ciobanu if one had asked me, but was not really surprised or disappointed when he got second, because I know juries have (some) other criteria than the public (and thank you indeed, Mr. Donohoe, for giving us some insights into that), but also because as far as I have observed, 2nd and 3rd prize winners often have better careers than 1st prize winners (and thanks again to Mr Donohoe for indicating why this might be so). Anyway, it is not every classical musician who so charms the public, giving of himself and at the same time keeping up an appearance of gentlemanly insouciance and even recklessness in the face of „slip-ups“ and what must generally be a situation of extreme stress (a bit like the heroes of our adventure stories – Raffles or Arsène Lupin etc. ); Bernard Shaw spoke of „that deep need for the sympathy, or at least the attention, of the farthest away and humblest person in the shilling gallery, which marks the great public artist.” I can say that even via Internet, I thoroughly enjoyed Ciobanu’s performances (I smiled quite a lot – which is good for one’s health 🙂 and felt enriched by them (for want of a better word). I also very much liked the Schumann quartet, by the way, I even thought that the strings were in better form here than in any of the other performances I watched. And confound any false notes ! Someone recently wrote that contrary to popular belief today’s audiences are no less tolerant of false notes than audiences a hundred years ago, as long as the right ones prevail. Anyway, I am sure he will make his way and just hope that he will have the strength to resist any temptations that may well come his way to let himself be made into a commercial product. I was shocked to learn that Nehring took first prize in the Rubinstein. I heard him in all rounds in Warsaw and was surprised when he made it to the finals. He’s a big player, but not a particularly graceful one. That he took the Audience Prize in Warsaw had much more to do with his nationality — he was the only Pole in the finals — than his pianism. To judge from audience reactions, Kate Liu — the bronze medal winner who was awarded the Mazurka prize — was not only a much finer pianist, but also a more popular one. There were, in fact, at least two or three young Polish pianists I preferred to Nehring — none of whom made it as far as he did.